Standing desks are a hot topic today, with study after study revealing the harmful effects of prolonged sitting. For example, this article cites research that links physical inactivity to 21-25% of breast and colon cancers. I thought that sitting was neutral for your health, but when I realized it could reduce life expectancy, I basically jumped out of my chair. About a month ago I decided to try one for myself and since then, work has been anything but “business as usual.” I stood up for an interview to discuss how a standing desk has impacted my work and well-being. Q: Why did you decide to switch to a standing desk? A: I read articles with frightening statistics and quickly became convinced I’d be healthier if I made the change. But beyond the articles and research, I figured taking a break from sitting was a logical choice—why have legs if I’m not going to use them? I also have (or, had) frequent back pain and thought a standing desk might help with that. Q: Did you fashion your own standing desk, or buy a new one? See? Books are still useful! 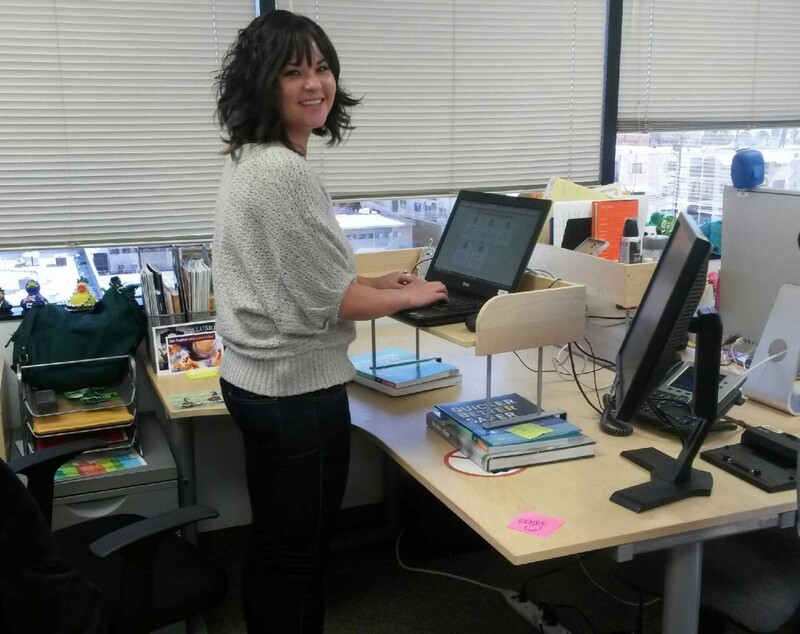 A: My brilliant boss Melissa helped MacGyver a standing desk out of what I already have. My current setup is a bookshelf propped up on books, which makes it a sort of statement on the changing role of literature in modern society. One of the books is called The New Office. You can’t make that up. Q: What kind of shoes do you wear that are comfortable enough to stand in all day? A: Ideally, I’d stand barefoot on a square of grass—and eat a Paleo diet while writing blog posts on a cave wall. Instead, I usually wear classic Toms or flat boots. I never wear heels—just the thought of them makes me uncomfortable! Q: Do you still have a chair? A: I do, because it’s pretty hard on your feet to stand for hours on end. I sit down every hour or so for a few minutes to give my feet a rest. When I sit, I just move my mouse down to desk level and keep my computer where it is. Typing is awkward, so I usually just read when I’m seated. Q: Does a standing desk give you vertigo? A: No, it’s iOS 7 that does that. Q: What are the benefits you’ve experienced? A: I have significantly less back and neck pain—that’s been the greatest reward of all. I also feel more focused and energetic when I stand. I’ll make myself finish a task before I take a sitting break, which forces me to work efficiently. Q: Do you plan on making any changes to your arrangement? Just LOOK at that posture! A: In my wildest dreams, I would try standing on a mini trampoline or a balancing ball or one of those balance boards. I don’t think that will be allowed though, because I would most likely injure myself and neighboring coworkers. A treadmill desk would be interesting, but probably too distracting to others. 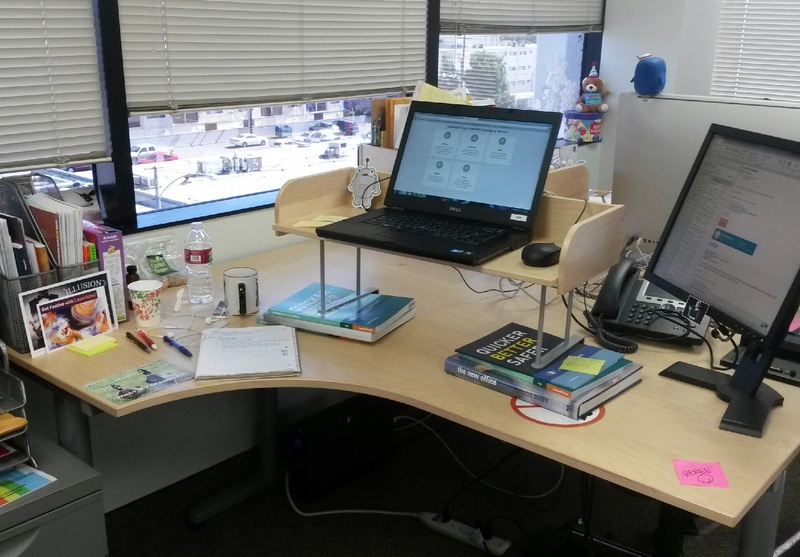 Q: What advice do you have for anyone interested in switching to a standing desk? A: You should make sure you’ve got comfortable footwear or possibly a mat to stand on. Your desk should be at the right height, so that when you type your arms are bent at a 90 degree angle. When you’re starting out, make it easy to switch back and forth between standing and sitting. If you don’t, you’re more likely to give up entirely and go back to a traditional desk. Also, don’t lock your knees or you’ll pass out. Standing desks are just one of the ways you can work smarter! 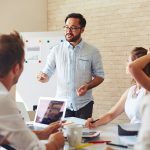 To find out how you can optimize your time at work, get your copy of the new Simplicity 2.0 eBook.